U.S. Soldiers Told To Repay Thousands In Signing Bonuses From Height Of War Effort : The Two-Way Under threat of wage garnishes and tax liens, the California National Guard is pursuing bonuses it says it never should have paid. The Pentagon is seeking millions of dollars from nearly 10,000 current or former soldiers in the California National Guard, saying they weren't eligible for re-enlistment bonuses. Here, soldiers from the state's guard force are seen in 2010, resting during transport in northeastern Afghanistan. In most cases, when an employer pays a signing bonus to attract new workers, that payment is understood to be essentially unrecoverable. But the Pentagon has a different understanding — and it's ordering the California National Guard to claw back thousands of dollars paid to soldiers who re-enlisted to fight in Iraq and Afghanistan. And in many cases, an employer would also have a tough time arguing that decade-old lapses in its own oversight should trigger wage garnishments and tax liens against its workers. But again, this is the U.S. military, and its officials say the law requires them to reclaim the overpayments. That's the gist of a report by The Los Angeles Times, which says nearly 10,000 soldiers are now scrambling to pay back signing bonuses that helped the Pentagon cope with the task of using an all-volunteer service to fight two prolonged international conflicts. In addition to doling out cash for re-enlistment, the Pentagon offered student loan repayments. The incentives were seen as crucial to the military's effort to keep its ranks flush, but auditors say the rules should have limited the largest payments to certain skill areas — and that in the rush to staff the war effort, the bonuses were given out too liberally, the L.A. Times reports. Responding to the newspaper's story Sunday, the California National Guard points out that the repayments are part of a federal program run by the National Guard Bureau and the Department of the Army. 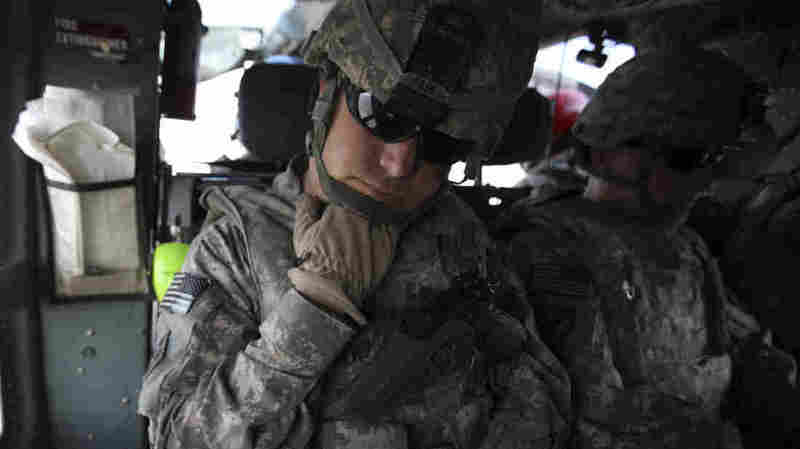 "The California National Guard does not have the authority to unilaterally waive these debts. However, the California National Guard welcomes any law passed by Congress to waive these debts. "Until that time, our priority is to advocate for our Soldiers through this difficult process." In its statement, the service adds that its adjutant general, Maj. Gen. David S. Baldwin, created an assistance center that has helped some of its soldiers retain $37 million "of original bonus payments." The problem of improper use of military troop-level incentives isn't limited to California — but the state has emerged as a focal point because of two factors: the large size of its guard force, and a history of overpayments. A scandal over the California National Guard's use of bonus money was first unearthed in 2010, when the Sacramento Bee reported that its incentive program had misspent as much as $100 million. The program's onetime leader, former Master Sgt. Toni Jaffe, was later sentenced to 30 months in prison, after pleading guilty to making $15 million in false claims. When it was first discovered, that scandal was deemed "war profiteering" and was said to have benefited guard members who hadn't logged any combat duty; high-ranking officers were mentioned. But in the years since, lower-ranking service members have complained about garnished checks and a prolonged review process, saying they've done nothing wrong. With the work of 42 auditors who reviewed the California cases now complete, the repayments are back in the spotlight — and service members and veterans, as well as members of the public, have been venting their anger. On the California guard's Facebook page, several people hijacked a post about training to comment on the bonus repayments, with one man writing, "The officials who screwed over our service members need to do the right thing and pay back the money. DISGUSTING." And after the guard responded to the Times story Monday, a commenter criticized its stance, writing, "Meanwhile vets are suffering while one bureaucracy waits to 'welcome' another bureaucracy to take responsibility and force it to do the right thing. Pathetic." Revelations about fraud and mismanagement in the Pentagon's retention program emerged after the program's budget swelled between 2000 and 2008 — when the Defense Department went from spending $891 million for selective re-enlistment bonuses to spending $1.4 billion on them, according to a 2010 research paper by the RAND defense institute. By the end of that period, the military was also spending $625 million yearly to pay enlistment bonuses. It's not unusual for signing bonuses to have strings attached. But in the civilian world, conditions for repayment are often limited to cases where an employee spends less than a year in their new job. In the case of the California National Guard, soldiers who say they held up their end of the contract — serving the required three- or six-year re-enlistment period — are being told to repay a key incentive. One of them is Robert Richmond, who has begun an online petition that calls for the Army to "stop stealing back signing bonuses 10 years later." Richmond says he signed the contract in good faith, and in his petition, he describes a scenario that's reminiscent of the recent Wells Fargo cross-selling scandal, saying that a lower-ranking figure has been punished for committing fraud that was motivated at least in part by a need to meet targets set by her superiors. "Like many other soldiers, I honorably completed my contract in 2012 and two years later they sent me a letter stating I had to pay the money back. Each contract has a different excuse. They stated the reason I was not eligible for the contract was because I had over 20 years of service at the time. I had originally signed up more than 20 years prior, but had breaks in service and only had 15 credible years of service, not 20. Although at the time, they informed me I was eligible for a bonus, now they are saying I was not." Like other veterans who are refusing to pay up, Richmond is now incurring interest on the repayment amount. In its General Rules about the recovery of pay and bonuses, the Department of Defense states, "As a general rule, repayment will not be sought if the member's inability to fulfill the eligibility requirements is due to circumstances determined reasonably beyond the member's control." But after dozens of auditors reviewed its system that had paid soldiers bonuses without determining their eligibility, the California National Guard's veterans started getting repayment notices. "People like me just got screwed," a 42-year-old veteran tells the Times. That veteran, former Army Capt. Christopher Van Meter, fought in Iraq. He tells the newspaper he refinanced his mortgage to repay $25,000 in re-enlistment bonuses and $21,000 in student loan repayments. Another veteran — former Army Master Sgt. Susan Haley, who served in Afghanistan and spent more than 25 years in the service — tells the newspaper that she's now sending the Pentagon $650 each month to repay $20,500 in bonuses. "I feel totally betrayed," Haley says. "The objective of the SRB program is to increase the number of reenlistments in critical MOSs [Military Occupational Specialty] that do not have adequate retention levels to man the career force. Although Department of Defense policy permits SRB payments of up to $45,000.00, soldiers may be paid bonuses up to six times their monthly basic pay at discharge, times the number of years of additional obligated service, or $20,000.00, whichever is less." While some veterans are working to repay the money, others are filing appeals, engaging in what's likely to be a prolonged fight against the service to which they once belonged. California National Guard officials tell the Times that they've been helping veterans through the appeals process. "We'd be more than happy to absolve these people of their debts," Maj. Gen. Matthew Beevers, deputy commander of the California National Guard, tells the Times. "We just can't do it. We'd be breaking the law." One of the earliest reviews of the Army's post-Iraq invasion bonus system came in 2007, when the Defense Department's inspector general examined the program called the Reenlistment, Reclassification, and Assignment System (RETAIN). But at the time, the central issue wasn't whether too much money was being paid, but rather whether the service was paying out bonuses quickly enough.